Mix-a-lot kickboards offer a unique look. People often focus on the end result when it comes to competitive swimming. They see the swimmers at their meets swimming at unthinkable speeds, but have you ever stopped to wonder how they got that far? Using the right training gear is essential, including the junior fun gear available from Speedo. This equipment is perfect for kick drills and working out your arms, as well as increasing leg strength. Kickboards are an essential element to help you increase your leg strength and focus on the precise movements required to move effortlessly through the water. The new full-size and junior fun gear is ideal for holding kick drills. These drills are required to help you build your leg strength so you can be a stronger swimmer overall. With the new mix-a-lot kickboards, you will find a comfortable hold that helps you position yourself to help maximize the effect of this workout. It also provides you with a way to really make a statement with its fun colors and patterns. In addition to their new line of kickboards, Speedo has also designed pull buoys in a similar style so you can mix and match your swim training gear. In contrast to the effect kickboards have on kicking, the pull buoy can help take the focus off your kick and help you enhance your arm movements as you swim through the water. You won’t have to worry about staying afloat because the devices will keep your legs in place and floating as you swim. Whether you choose the full-size or junior fun gear, you will find well-constructed tools that will help you become a more effective swimmer. Training to become a more effective swimmer requires using the right equipment. Whether you’re focused on your kicking or you want to work on strengthening your upper body, the newest kickboards and pull buoys from Speedo can be an effective option. Not only does this gear offer the assistance you need to become a better swimmer, but it looks great in the water as well! If you’re looking for the best swimming gear on the market, contact us. We can provide all the latest Speedo gear to best meet your needs. The right swim training gear makes all the difference. Whether you are just getting started with competitive swimming or you’ve been involved in the sport for a significant amount of time, it’s important to use the right swim gear to enhance your training. Speedo offers a vast array of team gear and junior gear designed to help you make the most of your training sessions. The right swim equipment will make all the difference in your performance so you can be sure you are always on your game. One of the most important types of training team gear is the kickboard. While many people think these boards are designed for young swimmers who are just learning to swim, they can still be an effective tool for seasoned swimmers and those who are interested in getting involved on the competitive level. When using kickboards in your training sessions, you will be able to isolate the movement of your legs, allowing your upper body to float through the water without worrying about the motion of your arms. Focusing on just one element of your swimming technique will help you improve your performance. Just like the kickboards, using a pull buoy takes your legs out of the equation as you are working on your swimming technique. When you use this swim equipment to enhance your performance, you will be able to focus solely on the motion of your arms as the pull buoy keeps your legs afloat behind you. This valuable asset allows you to improve one area of your technique before putting the entire picture together to become a more effective swimmer overall. Swim gear is such an important component to learning how to swim more effectively so you can perform your best in every meet. Whether you need adult-sized team gear or junior gear is required, you can find a variety of swim equipment designed to help you isolate various movements to improve your overall performance. Kickboards and pull buoys are both effective tools that will enhance your performance and help you become a better swimmer overall. If you’re looking for the best competitive training gear, contact us. We carry a vast selection of swim equipment to help you improve your technique and your performance. Just like any other sport, training to be a competitive swimmer takes a lot of work and sometimes requires special training equipment to help strengthen specific muscles or work on certain techniques. Whether you are working on your own or with a coach, using these pieces of equipment can make a difference in your ability to compete and win. Understanding how each of these pieces of swim training equipment can help will show you how to become a stronger swimmer. Upper body strength is an important part of swimming. If you rely too much on your legs to propel you through the water, you will find yourself tiring more easily. Pull buoys are a great way to get you to focus on strengthening your upper body and helping you rely on it to get yourself through the water. A pull buy sits between your legs while you swim, restricting the use of your legs so you are forced to use your arms and upper body instead of your legs. This will strengthen your upper body and arms for better swimming. Swim training equipment is an important part of becoming a better swimmer. When you think of swim fins, you probably think of diving or going snorkeling. 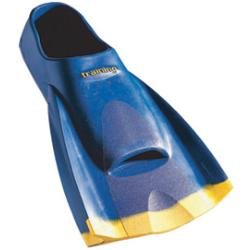 However, if you buy the right ones, you will be able to use swim fins as a training tool for swimming. Even though you don’t want to rely too much on your legs, you need strong legs to be a strong swimmer. If you use swim fins in your training, you will be forced to kick harder for the same results because of the increased resistance from the water. Speed and strength aren’t the only thing you need to concern yourself with in your training. It is important to have good rhythm in your strokes as well. This is where a tempo trainer can help you. This trainer can be set for any tempo and will beep at regular intervals, depending on the setting. This will help you develop your rhythm, which can help with your speed. An erratic stroke will actually slow you down. Making use of the training tools available helps you to improve your swimming and increase your chances of winning. Without the use of these tools, you can still do well, but it never hurts to do everything you can to improve yourself. From strengthening exercises to your timing, every little aspect of swimming must work together to make you a stronger swimmer. A pull buoy is used to help competitive swimmers train. The Speedo pull buoy is placed between the inner thighs and forces a swimmer to use maximum upper body strength to propel themselves through the water. A pull buoy is used by competitive swimmers who are teenagers or older from the amateur to the Olympic level. There are two types of pull buoys. One is a single piece and the other has two pieces, which latch on to the legs. The latter is commonly used for those who are new to using the tool. The slim portion of the pull float goes between the thighs. Two-part pull buoys can be adjusted with the straps, so it fits the swimmer properly. Swimmers should swim with the Speedo pull buoy between the thighs with their ankles crossed. This is difficult to do and adds to the intensity to your training. Even seasoned swimmers will have trouble swimming with a pull buoy, but remember that’s the point of practicing with one. You’re looking to dramatically increase your upper body strength. The pull buoy will come loose if you do not cross the ankles. It may take time to adjust to swimming this way, but don’t let the strange feeling deter you. Your body may not be used to practicing with so much dependency on the upper body. With regular practice using the pull float, your muscles will adjust accordingly and you’ll find it’s easier to use after repeated use. Start at one end of the pull and secure the pull buoy. Push off from the wall of the pool and keep your ankles crossed tightly to keep the device in place. Toes should stay pointed behind you to keep drag at a minimum. You can use whatever technique you prefer through the upper body. Eventually, the momentum will slow and you will have to use your arms to propel yourself through the water. It’s important to note that to use a Speedo pull buoy, one should already be a good swimmer. A pull buoy is not a toy. If it is your first time using one and you’re a decent swimmer with no competitive swimming under your belt, you should be sure a lifeguard is on duty while you practice with the pull buoy. It takes time to adjust to the extra weight and the lack of lower body strength. Those who are not good swimmers can easily injure themselves or become overwhelmed in the water using a pull buoy. Some people think these strange foam things are pillows used for camping. Little kids often use them as building blocks, but swimmers know exactly what they are for. The pull buoy allows the swimmer to focus on training only their arms. A pull buoy or pull float is a shaped piece of foam used in swimming. Swimmers place the buoy between the legs in the crotch area to provide support to the body without kicking the legs, basically the opposite of a kickboard. Pull Buoys are an excellent training device for developing endurance and upper body strength. Using them gives the arms an intense workout by providing flotational support for hips and legs. 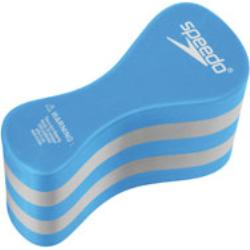 One of the best selling swimming pull buoys is the Speedo One Piece Pull Buoy. It is available in both the Speedo Jr Pull Buoy size and the Speedo Large Pull Buoy size. Good body position and technique can be established and the breathing rhythm can be refined. This piece of equipment is a good aid to help swimmers enjoy their training. The pull buoys also provide swimmers with heavy legs a way to be better positioned in the water. There are many different sizes, shapes and colors to choose from. Be sure to pick one that will just give you enough buoyancy to level out your body position. A pull float that is too small will allow your legs to drag in the water, while a pull buoy that is too big will float your legs and push your head and arms down in the water making it very hard to swim. Are you having trouble doing pull sets when swimming? Is your pull buoy too big or too small? Or are you having trouble figuring out what size pull buoy to use? The correct size pull buoy should keep your legs level with your body. Many people buy a buoy that is too big and causes your head to submarine into the water and your stroke then will break down. If the buoy is too small then your legs will drag in the water. The new Speedo Fillable Pull Buoy can be filled with water to vary floatation & drag. Buoyancy can be adjusted to provide proper body position for any swimmer, allowing for individual variances in the swimmer’s buoyancy, body position and ability. Buoyancy can be adjusted to increase or decrease drag during pulling sets. Neoprene cushion sides provide extra comfort & non-slip surface. Easy fill & drain valve allows for quick filling & draining.